Heat oven to 375°F. Divide dough in half. On lightly floured surface, roll each half of dough 3/16 inch thick. Cut into assorted shapes with cookie cutters, or cut around patterns traced from storybook illustrations. If cookies are to be hung as decorations, make a hole in each 1/4 inch from top with end of plastic straw. Place on ungreased cookie sheet. It’s important to keep the dough chilled, so work in batches. Mix the dough just until well blended, then divide it in half. Wrap each half in waxed paper, pressing the dough into a flattened disk. Then place on in the refrigerator while you roll the other. If you don’t have a pastry cloth, roll the dough between two sheets of waxed paper or plastic wrap. Lift off the top piece and cut out the dough with your favorite cutters (try to cut the dough out with as little space between as you can, to minimize scraps). To decrease the chance of the cookies spreading too much, pop the baking sheet with the cut-outs into the fridge for a few minutes before sliding them into the oven. Use a light hand when re-rolling dough scraps, gently pressing them together and rolling them out quickly. If the dough is overworked your cookies will be tough. Be ready for a big baking day by making your dough ahead of time. Do so by mixing up multiple batches of dough and dividing each batch into quarters. Roll out each quarter between sheets of plastic wrap to the thickness you need. Gently fold the wrap around the edges of the rolled dough, sealing it well. Stack the rolled dough (lift each piece with a wide spatula or flat baking sheet) on a baking sheet—store them in the freezer for up to 1 month. You can freeze unbaked or baked cut-outs too—ready and waiting for last minute baking or decorating. Flat baking sheets lined with baking parchment are the best choice for making cut-out cookies. The flat sheets allow the air to circulate around the cookies, so they bake evenly and become the right shade of light golden brown. For longer storage, consider making a hard-drying royal icing to glaze and decorate cookies you’d like to keep for trimming the tree. Some of the best holiday memories are made when we’re gathered together, baking a traditional treat like sugar cookies with icing. As the ingredients are mixed together, the dough is rolled and the decorations are completed, it’s good to know that some holiday traditions can continue to be carried on with laughter, creativity and love. Set aside an afternoon to enjoy every part of the process. Then sit back and delight in all the colorful cookies you’ve created. To prep for a fun day of baking, check out these handy sugar cookie guidelines for getting a perfect batch of sugar cookie cutouts every time. 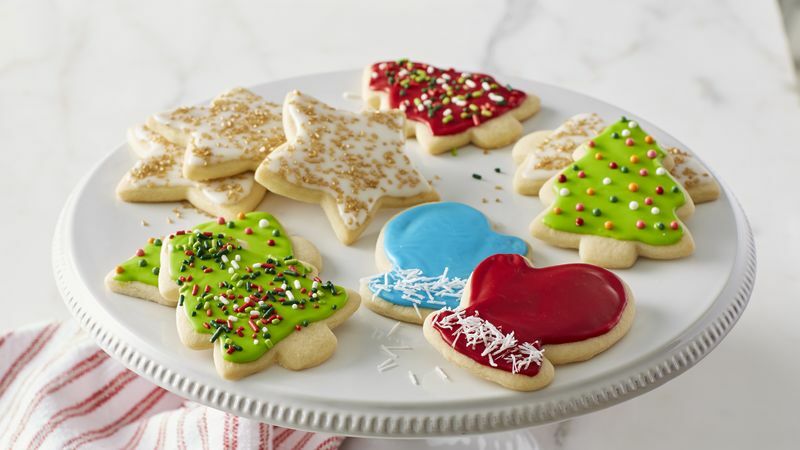 Whether you’re bringing your creations to a cookie exchange, adding them to holiday gifts, using them as decorations or saving them for the perfect dessert at your holiday meal, these sugar cookies will be special because you made them yourself. And that’s always the best holiday gift of all.